For people who want hands-on involvement in designing their dream home, Lindal Cedar Homes offers a new webinar on the custom design process, presented by architect-trained and Frank Lloyd Wright-inspired home designer Aris Georges. 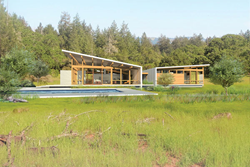 The Aura, a Lindal Cedar Homes design by OM Studio. Lindal Cedar Homes — the world's largest manufacturer of prefab post-and-beam homes — announced the launch of a new webinar on the custom home design process that debuts this Sunday, May 6, at 12 p.m. Pacific Time. The webinar, titled Custom Home Design with OM Studio Design for Lindal Cedar Homes, is presented by architect-trained home design professional Aris Georges. “I offer custom home design services for clients who want to work with somebody with an architectural background,” Georges said. The webinar is offered as a complement to Lindal’s monthly webinar presentation by former Lindal CEO and MIT School of Architecture graduate Michael Harris, titled Why is Lindal the Preeminent Prefab?, for those who desire a more custom-tailored approach to the design of their new home. Sign up for both webinars at https://lindal.com/news-events/. Georges’ love of architecture began in his teens, when he worked in an architectural studio in his native Greece. He went on to study architecture at the University of Florence, Italy, and completed his architecture degree at the Frank Lloyd Wright School of Architecture at Taliesin in Wisconsin. Georges served on the faculty at the School for 20 years before partnering with Lindal Cedar Homes through his company, OM Studio Design, to develop a line of midcentury modern-inspired homes, all based on the Lindal Elements grid system. Georges’ designs are rooted in the principles of architect Frank Lloyd Wright (1867-1959), the preeminent modern architect of the 20th century, who created organic homes that integrate with their natural surroundings and embraced the use of prefab materials. In the webinar, Georges explains how he works with Lindal’s international network of independent representatives and their clients to modify existing Lindal Cedar Homes floor plans and home styles so that they integrate seamlessly with the client’s build site and lifestyle needs. His interactive, creative process includes the use of online meetings, 3D modeling, and changes in real time through an iterative design process. To learn more, call 1-800-508-1833 or visit the company’s website: https://lindal.com. Lindal Cedar Homes, founded in 1945, is the world’s largest manufacturer of prefab post-and-beam homes for all generations. The third-generation family-owned company offers thousands of floor plans and home styles that can be modified to suit a client’s needs, budget, build site and lifestyle. Lindal Cedar Homes is headquartered in Seattle, WA, with an international network of independent distributors who work with clients through the entire process of designing and building their home. It is the only company in the industry to offer a Lifetime Structural Warranty on every home built. Further information about the company and its founder, Sir Walter Lindal, is available on the company’s website: https://lindal.com/about.